The tower is quite a sight in person, rising 316 feet (96.3 m; ~ 16 stories) on top of a concrete raft. The four clock faces themselves are 23 feet (7 m) in diameter and hold 312 pieces of glass each (though some are removed for servicing the dials). 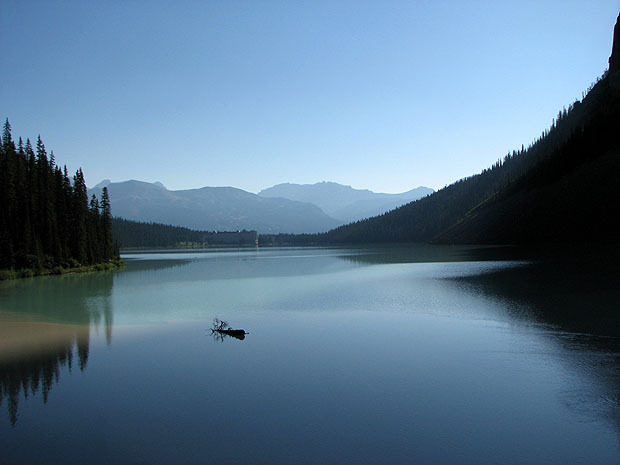 Yet it gets its name from the bell, a 16-ton monstrosity that was cast in 1856. This is actually the second version of the bell. The first one cracked in transport, and was melted down and re-cast. The current bell also cracked after being in use for two months, but it was repaired, rotated a bit, and given a smaller hammer. Even today it has a funny-sounding ring caused by the crack. Tours are available to go inside the Tower, but only if you are a UK citizen. Even then, you have to book it with your Member of Parliament way ahead of time. The rest of us just get to watch from the outside. That’s still cool, though. 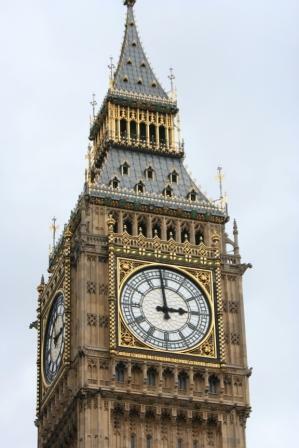 The light on the top of the tower indicates when Parliament is is session, the chimes play “The Cambridge Chimes”, the tower leans enough to be seen by the naked eye, and sometimes we can see some dudes risking their lives trying to clean the clock face (there’s even a game for that!). There are lots of other fun details about the clock I could talk about, but why don’t you see for yourself? This is my second clock feature in two months. So tell me, which would you prefer to see? Is there another clock somewhere you think is even cooler? Night photography is one of the more difficult techniques to learn. 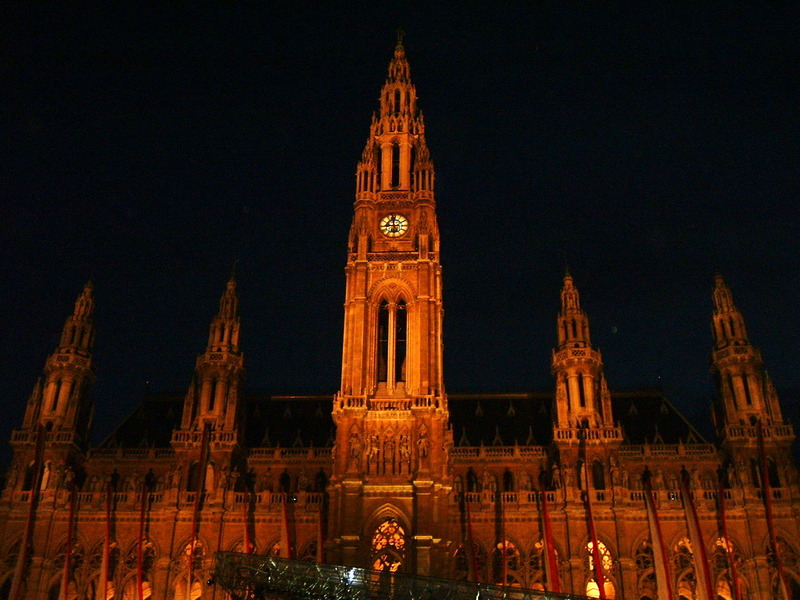 This picture of Vienna’s town hall (the Rathaus) came after several blurry or underexposed attempts I threw out. Mostly that is because you need light to take photographs, and at night, it can be hard to come by! Here are some simple tricks to help get you started, so you don’t have to be afraid of the dark. Know the weather forecast, sun and moon rise & set times, and any other factors (such as light pollution from cities) that can affect your photos and plan accordingly. Know this: flash is evil and it won’t help you in this setting. Turn it off. The key to night photos is long exposures, so learn how to adjust your shutter speed down or use a bulb (some pictures take 1/2 sec up to an hour or two). 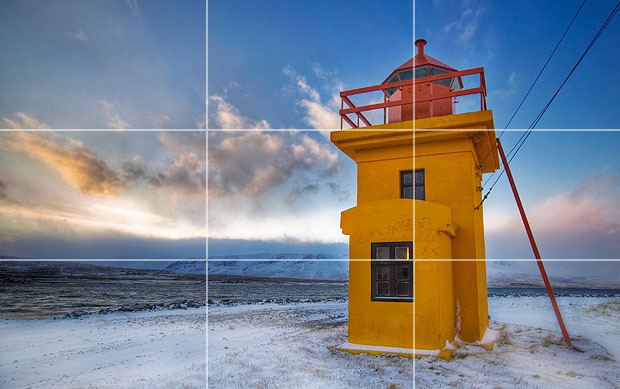 You will also need a higher aperture (11+) to keep your depth of field sharp as well as a higher ISO setting to let more light in (here’s an explanation of some of these settings). When in doubt, bracket your photos (most DSLRs will take 3 photos with different exposures in a range, so you can pick your favorite or combine them later). And yes, I know I broke these rules in this week’s photo. But hey, sometimes you just get lucky! Next, DON’T MOVE! Or at least, don’t allow your camera to move. 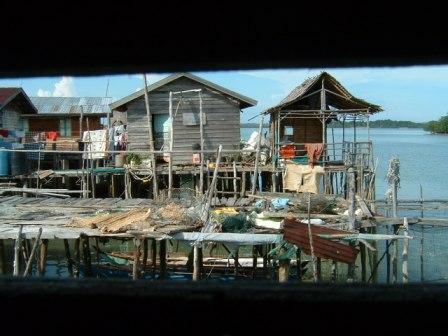 Use a tripod, and don’t press the shutter button to take pictures. Instead, use the camera’s self-timer, a remote control, or a cable release. Also, if using a DSLR camera, set the mirror lock-up function to further prevent internal camera shake. Don’t forget battery backup, warm clothes, and a flashlight! It will make your life a lot easier. Manual focus is helpful here, since autofocus typically won’t work at night. Set it to infinity for buildings and landscapes. The same goes for your automatic white balance settings. Manually set it to “Daylight” to get the correct colors. There is a lot of discussion on timing. Some photographers advocate shooting right after sunset to maintain colors and avoid streetlights, while others prefer the night sky around 2 am. Figure out what works best for you and try it! Finally, if you want to get REALLY technical, try light painting. What, besides fireworks, looks so cool at night that you really would like a picture of it? “I’m late! I’m late! For a very important da — hold on, what’s that?” Our tour group stopped in the middle of Munich’s Marienplatz (open square) to gawk at the loud clock with dancing figures on the side of the New Town Hall. For about 15 minutes, we watched various characters dance and perform jousting contests, until a little yellow bird at the top announced the end of the show. 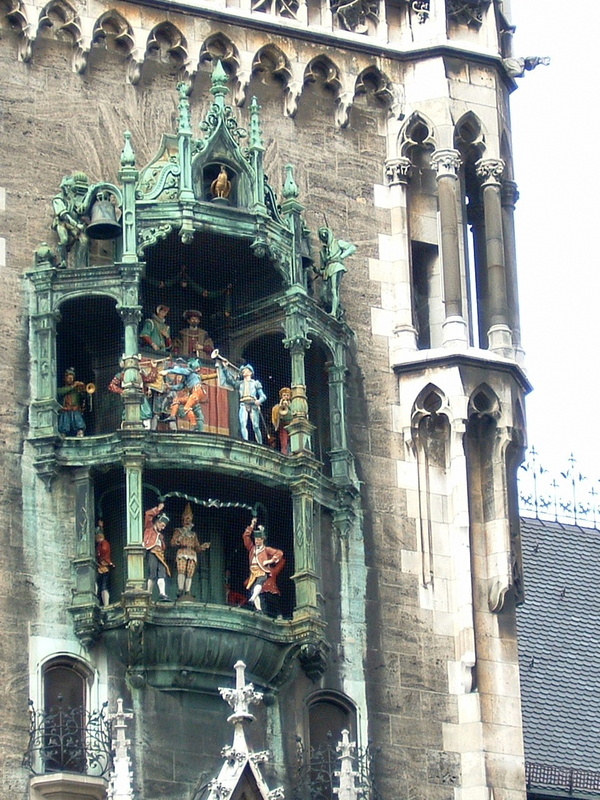 This clock, a part of Munich’s history since 1908, is the Rathaus-Glockenspiel (not the type of glockenspiel that’s a relative of the xylophone). It goes off every day at 11am and 12pm (as well as 5pm in the summer and a mini-show at 9pm). It contains 42 bells that play different tunes, as well as 32 life-sized figures. Later, I found out that the characters in the show were acting out important times in Munich’s history. The top section depicts the 1568 wedding of Duke Wilhelm V and Renata of Lorraine. Part of the 2-week party included a jousting tournament, depicted on the clock by a battle between a French & Bavarian knight (of course, the Bavarian always wins). You can watch a bit of this here. The lower level is a group of the city’s coopers (barrel makers) doing the Schäfflertanz, a ritualistic jig popularly thought to have begun during the plague in 1517. Duke Wilhelm V ordered the dance be re-enacted every seven years to remember the deadly disease (the next live performance will be in February of 2019). What’s the coolest clock you’ve ever seen? The Eye has a fascinating history. It was originally supposed to be a temporary structure, designed for a millennium landmark competition. It took seven years and help from five countries to build. 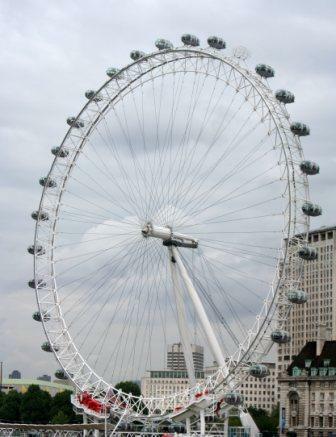 The parts were floated down the Thames River, and then the wheel was built on its side. It was lifted by degrees and took over a week to reach its final standing position. Today, it is used by 3.5 million customers a year. It has 32 “pods” (one for each of London’s boroughs) which hold up to 25 people each (or, you can book an entire private pod for $600-$1500). The pods are mounted on the outside of the wheel, allowing for 360° views without support structures getting in the way. It also moves about 0.6 mph (0.9 kph), allowing passengers to get on and off without stopping the wheel. I noticed when I took this picture that the wheel was missing a pod (top right). In preparation for the 2012 Olympic Games, the pods are being refurbished, one at a time. They are being swapped out at night, one by one, in order to keep the wheel going the rest of the day. I’d be excited to go see it once these are completed! In the meantime, there’s always the live webcam (when it works, anyway). If you could ride a giant Ferris wheel anywhere in the world, what would you want to see?